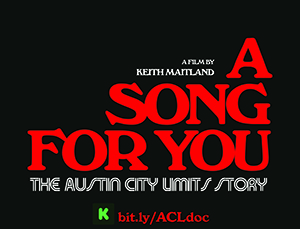 The legendary television music series Austin City Limits launches a Kickstarter Campaign on April 26, 2016 in support of the new documentary A Song for You: The Austin City Limits Story. The feature, which made its world premiere at the 2016 SXSW Film Festival, was directed by Keith Maitland, recently named one of Variety’s “10 Documakers to Watch.” The filmmakers have a 30-day Kickstarter goal of raising $125,000 to secure music rights for 70 songs featured in the 91-minute documentary. These funds will be used for finishing the film, which includes paying for music rights, the use of archival footage, and covering the costs of distribution. For more than four decades Austin City Limits has brought some of the greatest musicians in the world into the homes of millions of people. Now fans can have a piece of ACL history all their own. The Kickstarter drive will offer the opportunity for supporters to choose from a collection of unique, keepsake memorabilia and one-of-a-kind backstage experiences. Special perks include the chance to play the infamous Studio 6A piano immortalized by the likes of Ray Charles, Norah Jones, and Leon Russell, or to sign the exclusive Graffiti Wall, colorfully autographed by many of the music giants who have performed on the show, including Dave Grohl, Kings of Leon and Eddie Vedder. Other “thank you” gifts include pieces of the original wooden stage, graced by legends of music from Willie Nelson to Beck, and Stevie Ray Vaughan to the late Merle Haggard. The Kickstarter campaign launches Tuesday, April 26th at 10am. You can visit the project’s Kickstarter page here for more details.